Photo of the Day: Mayweather Sr., Manfredo, Mosley, Pazienza and Scully! Former light heavyweight contender and boxing trainer, John Scully (at right) sent this photo, taken at the Foxwoods recently. 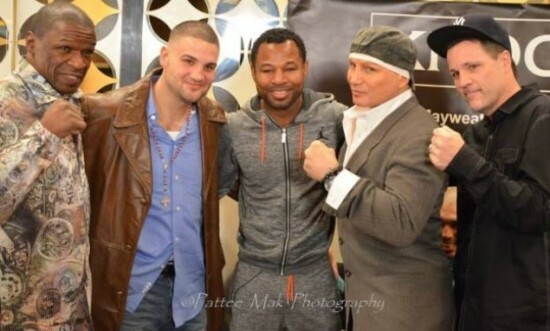 Pictured with him , left to right, are Floyd Mayweather Sr., Peter Manfredo, Shane Mosley, and Vinny Pazienza. LOS ANGELES, CA, November 21, 2012 – TeleFutura “Sólo Boxeo Tecate” will broadcast a special Thanksgiving Classics edition featuring a pivotal bout in Puerto Rican superstar Miguel Cotto’s career when he faced fellow superstar Sugar Shane Mosley on November 10, 2007 in an exciting 12-round welterweight world championship fight. The special Classics edition which will air on November 24 at 11:00 p.m. ET/PT and will preview Cotto as he prepares for his December 1 fight against Austin Trout for Trout’s WBA Super Welterweight World Championship at Madison Square Garden in New York City. LOS ANGELES, CA, November 21, 2012 – Puerto Rican superstar Miguel Cotto returns to his home away from home on December 1 at Madison Square Garden in New York City where he will challenge Austin Trout for his WBA Super Welterweight World Championship. Before this meeting of champions in the “Mecca of Boxing,” FOX Deportes Classics delivers two of these fighters’ most impressive victories on Saturday, November 24 at 10:00 p.m. ET/7:00 p.m. PT. “Tonight we gave the fans what they wanted to see. We matched the best with the best. Cotto was a very tough competitor and he won some rounds. He pushed me to the limits and this is what it’s all about. “I can only say good things about Sugar Shane Mosley. He is a great champion, but I have trained hard for this fight and I feel that I am going to win it. It’s going to be a victory for all of Mexico.